As we measured the barrel sizes of baseball bats, we also measure the size of fastpitch barrels too. 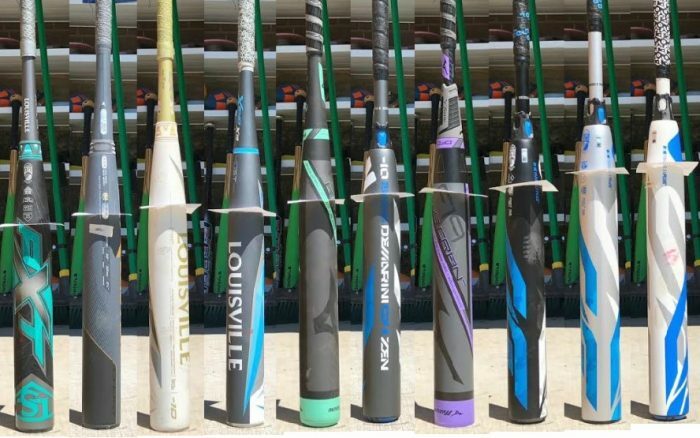 We found DeMarini’s CF Zen in the drop 11 (as well as the CF-XD) to have the longest barrels. The smallest of the bunch was Louisville Slugger’s PXT but not by much. Amazon price check the CF Zen Drop 11. This information supplements our awarded 7 best fastpitch bats. From largest to smallest the total variance lasted about 1 1/2 inches. The difference in barrel length appeared determined by the speed of the taper from knob to handle. The 2019 CF Zen in a drop 11 had the biggest barrel size. Of some note, bats that ran heavy on our swing weight tests tended to have a shorter barrel. That included the likes of the PXT and the Ghost Double Barrel from Easton. Does Barrel Size Matter in Fastpitch? For some the size of a fastpitch bat’s barrel does matter. A bigger barrel means more chances for contact. And, some would argue, a bigger barrel gives the bat a better chance to have a larger sweet spot. As they say, all is fair in love and sales. However, the difference in maximum barrel size is so small, and the taper so minute, that it is hard to see how a faster or slower taper would effect performance any. Granted, the small amount of volume associated with a bigger barrel may give a greater chance for a foul tip once in a millennia and, therefore, keep the at bat alive. In the end, all other things being equal, a rational player would prefer a larger barrel profile over another. But we think there more important differences in fastpitch bats (like which ones perform the best) than the smallest amount of changes in barrel profile. What length fastpitch bats were used for this test? I ask, because at least with the USSSA Easton Ghost the barrel on the 30 inch bat is significantly smaller then other 30 inch bats of different brands and I am wondering if that holds true of 31 and other length bats. Lastly, have you found that the 30 inch USSSA -11 Easton Ghost is significantly heaver than a -11? Good question Chris. We use the 32 inch. We found that it doesn’t hold exactly true across different lengths of the bat. But, the 32 seems to be the best representation of the size of the barrel.